Psychology is a broad field with a lot of different disciplines and specialty areas, and many more different ways to apply them. There is a lot you can do with a master’s degree in one of those disciplines, everything from becoming a school psychologist to becoming an expert in advanced smartphone user interfaces or social media interactions. And that means that potential graduate students come to the field from a wide diversity of backgrounds and with a broad array of motivations and goals. Not everyone going to school for a master’s in psychology is interested in or destined to earn a PhD and become a licensed clinical psychologist. Nor is everyone coming to the field on a straight-line path after earning an undergraduate degree. You might have spent several years out in the workforce already, on the job getting some meaningful real world experience to put under your belt before deciding to come back and further your education with a master’s. That experience offers advantages, but it also shapes your expectations. You’ve been out proving yourself in the real world for a few years—the last thing you want to hear when you go to sign up for classes is that you need to take some arbitrary test first to prove you can hack it. You’ve also been providing for yourself and your family so you understand the value of a buck in a way maybe you didn’t when you were an undergrad. If this all sounds familiar, then it might be the very script that’s been running through your head as you consider going back to school for a master’s degree to up your game. It’s clear that what you’re looking for is a selection of affordable master’s degrees with no entrance exam requirements, and that’s exactly what we’ve put together for you here. Finding schools without entrance exams was easy: they either require them or they don’t. These ones don’t! Finding the most affordable among them took a little more work. What defines affordable is different for everyone, and can mean different things in different parts of the country. You wouldn’t expect a private university master’s in Manhattan to cost the same as one at a state school outside of St. Louis. But what we can all agree on is that the lowest cost program in comparison to all the other options within driving distance would absolutely be your most affordable option. We started by determining the average cost for a psychology master’s program for each state, including both schools with and without entrance exams. We then worked our way through the list to identify the lowest cost options with no-entrance exam requirement. Then we divided it up by public and private schools since the cost structures and respective benefits are different. The way we present all this information is just as simple and straightforward. But we know there’s a lot more that you need to know before you can make a decision about which program is going to work for you. We were in the unique position of being able to look at a lot of different kinds of information about a lot of different schools in the course of building this list. It only made sense to collect and organize that information so we could present it right here along with the tuition costs. The idea is to give you everything you need to know to make an informed decision since you can’t make the call about which program is going to set you up for a successful career without looking beyond the cost. There is no specialty programmatic accreditor for psychology master’s programs. There is, however, an agency that sets strict curriculum standards and maintains a rigorous accreditation process for the PhD and PsyD programs that lead to full authority psychologist licenses: the APA (American Psychological Association). Naturally, many schools offering APA-accredited doctorate programs also offer master’s degrees, and those programs are taught with the same philosophies and often by the same faculty as the doctorates. So we figure if the doctorate program at the school is good enough to be accredited by the APA then the master’s program is probably in the same league. Every school on this list meets that qualification. It’s worth noting that although it’s common in psychology for programs to offer a master’s as an integral component of a terminal doctorate degree, all the master’s degrees on this list are available as stand-alone programs, not just as stepping stones to a doctorate. Many of the degrees we looked at have a very specific focus area. That specialization is everything when it comes time for you to make your choice—it’s not going to do you much good get an MA in marriage and family therapy if your career path is heading toward industrial and organizational psychology. We list all the specializations available through each of these programs so you can start by identifying just the ones that meet your most basic requirements. Actually, online options are pretty terrific for everybody, working professionals and full-time students alike. The flexibility that comes with courses that can be viewed online at any time, from anywhere, is a big selling point for both busy professionals holding down a day job and for just about anyone who values their own time more highly than trudging down to campus for class a few times a week. On the other hand, many people continue to value the face-to-face experience that traditional on campus courses bring to the table. We make no value judgments here about which option is best, we just let you know what formats each of these schools makes available so you can decide what’s going to work best for you. Who you are learning from can make all the difference with a psychology degree. You can read the same material out of the same textbooks at any of these schools, but an artful instructor can drive home the lessons in ways that will both change your life and shape your career. We looked for highly-qualified, highly-respected faculty and let you know if they are active professionals or engaged in interesting research outside the classroom. A school’s overall reputation can be pretty important if you’re going into a competitive job market. Some schools are known for research or educational opportunities in specific subjects, sometimes in line with their concentrations or sometimes outside of them. We let you know what the word on the street is about each program, and if they have been ranked by some national rating agency like U.S. News & World Report. Every program shown here accepts students without putting them through the taxing process of having to prepare for and take an entrance exam…every one of these programs is offered at a school of psychology that also offers an accredited doctorate so you can be confident in its quality…and every program here represents the lowest priced options that meet those basic criteria. How does media influence behavior, and how can media be used to affect positive social change? That is the core of the MA in Media Psychology at Fielding Graduate University, a superbly priced program that’s nearly $22,000 less than the state average for psychology master’s degree programs. This innovative program, which complements the university’s PhD program in media psychology (the first program of its kind in the country), the MA in Media Psychology is delivered entirely online, thereby allowing emerging professionals like you an opportunity to earn your master’s degree, regardless of your professional obligations and geographical limitations. And while this program is distance-based, you’ll enjoy unique opportunities to engage with faculty at exciting events across the country. Palo Alto University’s MS in Psychology offers everything you’d want in an innovative, cutting-edge program in psychology —a low price and fully online course delivery. Your online master’s program at Palo Alto is supported by more than 17 years of online teaching experience, thereby allowing you to enjoy both an affordable and flexible course of study that will prepare you for psychology careers or further study through the university’s PhD in Clinical Psychology. In fact, if your sights are set on further doctoral study, you’ll love that all the credits of your master’s program will transfer to the on-campus PhD in Clinical Psychology at Palo Alto. The online platform for the MS in Psychology features a virtual classroom where real-time interaction ensures a dynamic learning experience. During the course of this program, you’ll study on your own and also participate in weekly evening remote classes, chat rooms, and threaded discussion groups for a truly well-rounded and engaging course of study. Convenient, evening courses in West Los Angeles, Irvine, or Encino, and a total program cost coming in over $1,500 less than the state average for psychology master’s degrees in private institutions – these are just a couple reasons why Pepperdine University’s MA in Psychology should be on your short list. Whether you’re preparing for a doctoral degree, professional advancement, or for any one of a variety of jobs in the field of psychology, Pepperdine’s MA in Psychology is designed with you in mind, thanks to its broad curriculum that provides you with a solid understanding of the principles of psychology. If you’re interested in a doctoral degree, you can transition straight into the university’s PsyD program, ranked sixth in the U.S. by U.S. News & World Report. Other perks of the MA in Psychology program here include an intimate and supportive learning environment…an outstanding, nationally recognized faculty made up of experts, scholars, and practitioners…access to an extensive alumni network…and the option of specializing your course of study in marriage and family therapy. 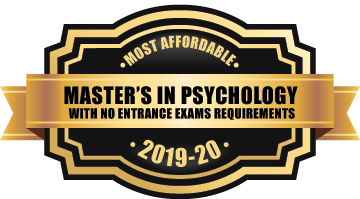 Whether your interests lie in marriage and family therapy, mental health counseling, school counseling, or industrial and organizational psychology, the Carlos Albizu psychology master’s programs have you covered – all at an incredibly affordable tuition rate. In fact, choose one of these master’s programs and you’ll enjoy a total program cost that’s between $10,000 and $12,000 less than the state average for similar programs at private schools. Whichever course of study you choose, you’ll feel confident knowing that you’re earning a degree that’s designed to prepare you to become a competent player in mental health and counseling. You’ll also be part of a program that features a low, student-to-faculty ratio and convenient, afternoon, evening, and Saturday classes that are led by an esteemed faculty of active professionals. Your pursuit of a career exploring the nuances of organizational effectiveness begins at the University of Hartford! The MS in Organizational Psychology not only comes complete with an affordable price tag, (over $10,000 less than the state average for master’s degrees at private schools) it’s comprehensive course of study ensures you’re ready to dive right in to an I/O psychology career that includes restructuring organizations, promoting teamwork, and solving organizational issues. You’ll also be part of a program that’s as much about flexibility and convenience as it is about affordability. In fact, the MS in Organizational Psychology can be completed on-campus or online, and on a full- or part-time basis. Choose the online program and you’ll enjoy an entirely distance-based program that requires zero on-campus visits. Or choose the on-campus program and you’ll enjoy evening courses that won’t interfere with your professional responsibilities. Nova Southeastern University’s MS in Forensic Psychology program is proof-positive that you don’t need to sacrifice quality for value. Choose this master’s program and you’ll enjoy an affordable price tag, which comes in nearly $11,000 less than the state average for psychology master’s programs at private schools, along with a robust curriculum that will prepare you for doctoral study or for a career in a variety of settings, including the courts, mental health facilities, corrections, treatment facilities, and more. And thanks to its fully online delivery, you’ll be able to continue to meet your professional obligations while you earn your master’s degree. As a student of the College of Psychology, you’ll be learning under an esteemed faculty with a variety of clinical and research specializations, while enjoying the benefits of small class sizes, opportunities to engage in faculty-led research, and superb faculty mentorship. Adler University’s opportunities for master’s-level psychology study are plentiful – and affordable! In addition to offering no less than three master’s degree programs in psychology – I/O psychology, military psychology, and applied psychology, this institution offers emerging professionals like you with a truly affordable program that comes in more than $12,000 below the state average for psychology master’s programs at private schools. Choose the MA in I/O Psychology and you’ll be part of one of psychology’s fastest growing specialties; choose the MA in Military Psychology and you’ll specialize in the unique mental health needs of military personnel, retirees, veterans, and their families; or choose the MA in Applied Psychology and you’ll be able to customize your degree by choosing from one of four contemporary emphases. Regardless of which program best aligns with your career goals, you’ll enjoy a fully online course of study that features engaging and interactive courses delivered through state-of-the-art technology. Andrews University is known for its contemporary and relevant programs based on a Christian worldview and its truly affordable tuition rates, and its MA in Educational Psychology program is no exception. This superbly priced program, which comes in nearly $15,000 less than the state average for psychology master’s programs at private schools, is also the comprehensive course of study you’ve been looking for. Featuring a blend of classroom instruction, group work, practical experiences, research, and the best in instructor-student interaction, the MA in Educational Psychology delivers a robust program that prepares you for further study at the doctoral level or to conduct and apply research, develop curricula, provide classroom instruction, and more. Other hallmarks of this program include small class sizes, a low, student-to-faculty ratio, and opportunities for short- and long-term global study trips. Featuring all the curriculum requirements you need to qualify for the Temporary Limited License in Psychology (TLLP) and a total cost that’s over $23,000 less than the state average for similar programs at private institutions, the Michigan School of Psychology MA in Clinical Psychology really does have it all. Thanks to an engaging, interactive learning environment that features a blend of classroom study, clinical training, and research, this program offers everything emerging professionals like you are looking for. This program also offers the option of day and/or evening classes and a specialization in ABA. St. John’s MA in Psychology arms you with a broad psychological foundation that’s perfect for a variety of professions and careers or for more advanced study in the field. This research-oriented course of study boasts everything emerging professionals like you need for success: a superb price tag that’s nearly $22,000 less than the state average for psychology master’s programs at private institutions…flexibility and convenience through evening courses and the option to complete the program on a full- or part-time basis…the option to choose a thesis or non-thesis track…and an opportunity to specialize in Social and Developmental Processes or Cognitive and Behavioral Processes. The master’s degrees in psychology through Teachers College at Columbia University not only offer an attractive price tag, but they’re also housed in the esteemed Department of Counseling and Clinical Psychology, known for its groundbreaking work in research, pedagogy, and clinical practice. It’s here you’ll receive superb guidance and support from MA program advisors who are there to help you achieve your professional development and career goals. Fieldwork sites in NYC, exciting research opportunities, and a robust curriculum that allows you to enhance your current career, explore new areas of psychology, or prepare for future doctoral study are all part of the graduate program here. A new offering from the Carlow College Department of Psychology and Counseling, the MA in Psychology continues the tradition of affordable and robust graduate offerings designed for today’s learner. Offered at the university’s beautiful Oakland campus, this program offers your choice of three relevant specializations for a truly customized course of study. Just some of the courses offered in this dynamic, on-campus program include Introduction to Positive Psychology, Foundations of Forensic Psychology, and Foundations of Educational Psychology. Small class sizes, an intimate learning environment, and a program cost that’s nearly $9,000 less than the state average for psychology master’s programs at private schools are all points that make this program a sure bet for both emerging and current psychology professionals. Chatham University’s tradition of highly relevant courses of study and affordable programs continues with the MA in Psychology, a well-rounded course of study that’s focused on experiential learning. As a student here, you’ll enjoy small class sizes, a full-time faculty with extensive experience in clinical, community, and research settings, and opportunities to participate in faculty-led research projects, present at conferences, and interact with your peers through cooperative coursework and student associations. Choose the MA in Psychology and you’ll be prepared to pursue doctoral work in psychology or advance your career. A career in community and school psychology begins through Duquesne University’s MSEd in Child Psychology, an affordable course of study designed to prepare you for the Board Certified Behavior Analyst (BCBA) designation and for further doctoral study through the school’s PsyD or PhD School Psychology programs. Housed in the School of Education, which boasts cutting-edge research, countless published books and peer-reviewed manuscripts, national and international recognition, and more than 85 years of experience producing leaders, the MSEd in Child Psychology is a comprehensive, innovative, and relevant course of study that comes complete with an affordable price tag. A competitive price tag and a fully online delivery are just two of the reasons why Regent University’s MS in General Psychology stands out from the competition. Choose this innovative program and you’ll explore the foundations of psychological science while you specialize by choosing a concentration that best aligns with your professional goals. Thanks to the program’s online, eight-week courses, you’ll be able to manage your professional and personal responsibilities while you earn your master’s degree. Whether your interests lie in further doctoral study or in advancing your career in psychology or a related area of study, the MS in General Psychology is designed with you in mind. You’ll be well prepared to meet Alaska’s licensing requirements at the master’s level (LPC or LPA) through the University of Alaska Anchorage MS in Clinical Psychology program, designed with an affordable price tag and with Alaska’s mental health needs in mind. This well-rounded course of education offers much more than value, providing students like you with a comprehensive course of study that will teach you best practices for Alaska’s community mental health settings. As a student of the MS in Clinical Psychology, you’ll enjoy excellent support and guidance from a dedicated faculty, along with small class sizes and collaborative research opportunities. You’ll also enjoy outstanding opportunities for hands-on learning through the Psychology Department’s Psychological Services Center, which houses state-of-the-art equipment, modern therapy rooms, and two student work rooms. A foundation in psychological theory, in-depth study in areas like human development, the psychology of teaching and learning, and research methodology, and a truly affordable tuition rate makes the University of Arizona’s MA in Educational Psychology a sure bet for emerging professionals like you. This program, designed to prepare students for doctoral work or for advanced positions in education, industry, and government, offers a comprehensive option or a thesis option. Since 1895, the University of Arizona has enjoyed a solid reputation for both its high-quality academic offerings and its value, earning it a top spot among U.S. News & World Report’s Best Public Universities of 2019; a ‘Best Buy’ in the 2019 Fiske Guide; and a top spot on the ‘Best Value’ list published by the Princeton Review in 2019. How can the use of psychology improve learning and the educational process? Through the University of Northern Colorado’s MA in Educational Psychology, this question (and many others) is explored in-depth by an award-winning faculty there to guide you as you transition in to the field. Offered in-person at the Greeley campus or through a fully online format, the MA in Educational Psychology comes complete with exciting opportunities to collaborate with your peers through the Educational Psychology Society and pursue research. The online program, which includes a closer look at the practical applications of educational psychology, features a cohort of educational professionals who work remotely through a dynamic, online learning platform. Whichever program is best for you, you’ll enjoy affordable tuition rates with a total program cost that’s nearly $6,000 less than the average cost of psychology master’s degree programs at public institutions in Colorado. The University of Maryland – Baltimore County, long recognized as one of the top schools in the country for both teaching and innovation, offers a Master’s in Professional Studies – Industrial/Organizational Psychology, a contemporary course of study that explores the major issues in the practice of human resource and organizational behavior management. In addition to the robust and comprehensive curriculum you’d expect from UMBC, this program comes with everything you’ll need for success, including a competitive tuition rate, a faculty of expert practitioners and industry professionals, and a flexible program design that includes full- and part-time study options and evening, weekend, and a select number of online courses. Whether you’ve set your sights on further doctoral study or for career advancement in a variety of educational and community settings, the MEd in Educational Psychology at the University of Missouri St. Louis will get you where you want to be – all at an incredibly affordable cost. And thanks to a convenient blend of in-person and online courses, earning your psychology master’s degree has never been easier! Interested in specializing your course of graduate study? Choose from an optional emphasis in either Character and Citizenship Education or Educational Research and Program Evaluation. Choose the MEd in Educational Psychology here and you’ll be part of the massive UMSL system, the largest public research university in eastern Missouri that boasts about 17,000 students and alumni in all 50 states and 63 countries. The University of North Dakota’s MA in Forensic Psychology offers the best of both worlds—outstanding value and a truly top-notch course of study. Priced nearly $6,000 less than the regional average for psychology master’s degrees at public institutions, this program is value epitomized, but it is as much about academic excellence as it is about affordability. Thanks to an online, part-time format, you’ll be able to complete the MA in Forensic Psychology while still maintaining your professional and personal obligations. The innovative, online learning platform features everything you’d want in a superb, distance-based program, including online academic and tech support, recorded lectures you can watch on your own time, and plenty of opportunities to communicate and collaborate with your peers. After completing all online coursework, you’ll come to the Grand Forks campus for one week, where you’ll interact with your instructors and peers as you prepare a final paper and presentation. Kean University is home to not just a host of exciting master’s degrees in psychology, but affordable master’s degrees in psychology! Priced nearly $3,000 less than the average cost of similar master’s degrees at public institutions in the state, you can be confident you’re getting the best education at the best price at Kean. With options in forensic psychology, human behavior and organizational psychology, psychological services, and educational psychology, the master’s degree programs at Kean are designed to prepare learners like you for further doctoral study or for advanced-level positions in everything from social services to law to corrections to mental health centers and beyond. As a student of Kean, you’ll also enjoy outstanding opportunities to participate in student organizations like the Kean Psychology Graduate Council, or on research teams, where you can present your projects at the annual Kean Research Days events or at regional, state, and national conferences. Housed in the Department of Psychology, one of the university’s largest grad departments, Stony Brook University’s MA in General Psychology is everything you’d want in a psychology master’s degree: affordable, comprehensive, and relevant. In addition to a total program cost that’s over $7,000 less than the state average for psychology master’s programs at private schools, this program offers a robust combination of broad, contemporary courses in psychology that can be completed in just 12 months. Designed with an emphasis on research training, the MA in General Psychology offers up plenty of opportunities to get involved with ongoing research or to begin independent research of your own. Plus, as a student here, you’ll have close contact with an MA faculty director who will guide you on everything from course selection to professional development. Priced more than $16,000 below the state average for psychology master’s programs at public institutions, Temple University’s MEd in Educational Psychology offers an affordable course of study that’s designed to provide you with a broad range of skills and knowledge in psychological theories within an educational setting. Plus, the flexible course design of this program features both full- and part-time options and evening classes to suit the busy schedules of working professionals. Choose Temple and you’ll be part of an esteemed university that enjoys an R1 ranking (highest research activity) by the Carnegie Classification of Institutions of Higher Education, placing it among the top 4 percent of all four-year colleges and universities in the country. The University of Pittsburgh’s MS in Applied Developmental Psychology, focused on the implementation of best practices in the field of human development, is both affordable and academically rigorous, providing emerging professionals like you with everything you’re looking for in a solid psychology master’s program. This program features an updated curriculum that reflects the most current knowledge related to ADP practice and research. As a student here, you’ll also have the opportunity to specialize your program by choosing from among four concentrations. You’ll also be part of the university’s esteemed School of Education, which is ranked 34th among all graduate schools of education in the nation by U.S. News & World Report.